Costs of production? Running costs? Environmental costs? What is environmental impact of mining the chemical processes of metal extraction? What are the economic benefits? What sorts of pollution may arise from the manufacture of metals? Should we recycle metals? How can we recycle metals? Reasons for recycling metals are discussed? These notes should prove useful for school/college assignments/projects relating to the environment. A summary of ways in which the cost of producing any chemical is given at the end of the page. These revision notes on the environmental impact of mining, economics and recycling, should prove useful for the new AQA, Edexcel and OCR GCSE (9–1) chemistry science courses. 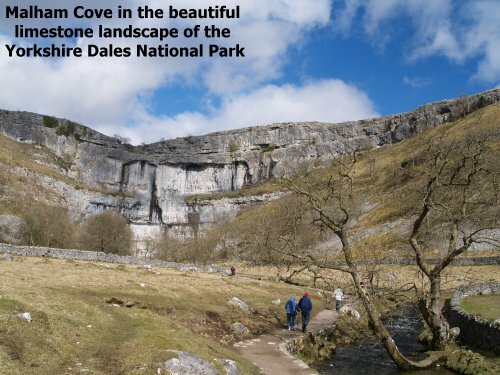 There are several limestone quarries in the limestone country of the Yorkshire Dales. The quarrying does present a scar on the landscape BUT limestone is a very useful mineral and used as a building stone, in iron extraction in the blast furnace and for making lime for agriculture and kitchen garden. There often has to be a compromise somewhere along the line since many of a countries important mineral resources and rocks are in some of the most beautiful scenic parts of the country! Aspects of this discussion applies to minimising the cost of production of any chemical product. Metal ores are obtained by mining/quarrying and that this involved digging up and processing large amounts of rock. Most ores are mined have to be concentrated before the metal is extracted and purified. This often results in lots of waste material that must be dealt with from an environment of view. This means that metal or mineral extraction results in problems and issues in balancing ecological, environmental, economic, social advantage factors. Useful products can be made from metal to enhance our lives – most consumer products we take for granted ie we expect to have them at our disposal. Valuable revenue if the mineral or its products are exported. Jobs for people, especially new sources of employment in poor countries or areas of high unemployment in developed countries. Wages earned go into the local/national economy leading to improvements in schools, health service and transport etc. See issues related to limestone quarrying, a detailed focussed discussion on extracting a particular mineral. Increase in local facilities promoted e.g. transport systems, like roads, recreational and health social facilities. Noise from process operation or transport of raw materials and products (lorries/trucks/wagons). Difficult to deal with, sound–proofing often not practical, but operations can be reduced for unsociable hours e.g. evening movement. Toxic carbon monoxide from the blast furnace extraction of iron, it can be burnt as a fuel, but it must not be released into the air unless converted to biologically harmless carbon dioxide. Sulphur dioxide gas from copper extraction of its sulphide ore is an irritating poisonous gas which can also cause acid rain, but it can be converted to the useful, therefore saleable, industrial chemical concentrated sulphuric acid, so you can remove a harmful pollutant and recover back some of the metal extraction costs, good green economics? Acidic gases like sulphur dioxide can be removed by bubbling through an alkali solution such as calcium hydroxide solution ('limewater') where it is neutralised and oxidised to harmless calcium sulphate. Cleaning a gas in this way is called 'gas scrubbing'. Mining operations will disfigure the landscape BUT it can be re–claimed and 'landscaped' in an attempt to restore the original flora and fauna. However in the case of a limestone quarry, I'm afraid there is no way round the fact that huge chunks of beautiful hills get carted away if we want to use it as useful mineral. Disused quarries and mines increase hazards in the landscape e.g. quarries can fill with water, old mine workings can collapse buckling roads through subsidence and producing sink holes. The cost of extracting and purifying metals is quite varied for several reasons. If the ore is plentiful it is cheaper e.g. iron ore, but silver ores and gold are much rarer and on that basis alone they would be a more valuable commodity. Reduction of ores using coke (e.g. 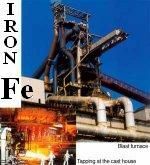 iron), made from cheap coal, is cheaper than the electricity bill for extracting aluminium from its molten oxide by electrolysis, but different metals have different properties best suited for particular and different uses. Generally speaking, more reactive metals (like Al) are more costly to extract than less reactive metals (like Fe) because of the different energy demands and ease of extraction, which may sometimes be due to more costly technology. RECYCLING – a very good idea because mineral resources are limited and manufacturing costs of many metals from their naturally occurring ores involves costly energy and environmental issues. Before any metals can be recycled the scrap metal must be collected, transported and sorted, which are cost factors themselves. The main problem is separating the useful metal from the rest of the rubbish. e.g. in domestic recycling plants iron and steel objects can be plucked out with a magnet, since most other materials are not magnetic. e.g. scrap iron is added to newly extracted from a blast furnace being converted into steel. Saves valuable finite natural mineral resources, only a finite quantity of metal ores, conserves a valuable mineral reserve - mineral sources cannot last forever! Saves energy, so less fossil fuels burned, good 'green' economics. Its cheaper to recycle metals that to start from scratch with raw unprocessed mineral ore. There will be less pollution and less waste. Reduces a waste disposal problem e.g. less piles of rusting cars and reduces environmental problems in general. Any reduction in landfill waste sites is a blessing on the environment, so this is now a real drive to recycle metals, plastics, glass and paper. Landfill rubbish sites are source of environmental pollutions from toxic materials leaching out and a health hazard from rotting decomposing organic material. Apart from reducing the accumulation of waste, there are waste disposal management issues e.g. how do store the waste? how dangerous is it? and environmental scientists/technicians are needed to monitor possible pollution of the surrounding air, water or land – more costs! It is less expensive than mining the original ore and extracting the metal, both these processes are eliminated and far less energy is used overall, so on several counts it will cost less money i.e. much more economic. Examples: The supply of copper–rich ores is limited so it is important to recycle as much copper as possible especially as demand for copper is growing as the economies of African countries, India, China and Brazil etc. are rapidly developing and becoming increasingly industrialised with the ensuing consumer demands for all the eg electrical products that we in the West take for granted. For every tonne of aluminium recycled you would need to mine at least four times as much bauxite ore and all the transport and extraction costs involved. You only need about 10% of the energy of extracting aluminium from its ore compared to recycling previously extracted aluminium and there is far less waste. Its quite easy to melt the scrap aluminium and re-cast in any desired shape - same applies to scrap iron and steel. The future of metal extraction from mineral ores? There are still huge deposits of mineral ores around the world which are and will be for some time fully exploited by the industrialised nations – soon most of the world? Because of these issues, new ways of extracting metals like copper from low–grade ores are being researched hopefully to limit the environmental impact of traditional mining. ... copper extracted by phytomining or by bioleaching ... for more detailed notes on exploiting low grade ores or waste from spoil heaps that may contain economically viable amounts of metal. Recycling cast iron or steel alloy scrap is a good example of some of the points discussed above, they can both be melted into freshly made iron or steel. About 42% of iron or steel in manufactured goods is recycled iron/steel, whether it be steel pans, car bodies, bridge girders, stainless steel cutlery etc. This makes good economics because recycling saves on several costs including energy and transport AND allows a mineral resource like iron's haematite or magnetite ore resources to last a lot longer – slower depletion of the Earth's mineral ore resources will make it last longer. The savings are partly reduced by the cost off collecting waste/scrap metal. There are particular problems due to the varying composition of alloys, but if the composition is known, or obtained from chemical analysis, the different compositions can be blended together to a desired alloy composition. The haze of pollution from Redcar Steelworks on the North Sea coast of North East England. 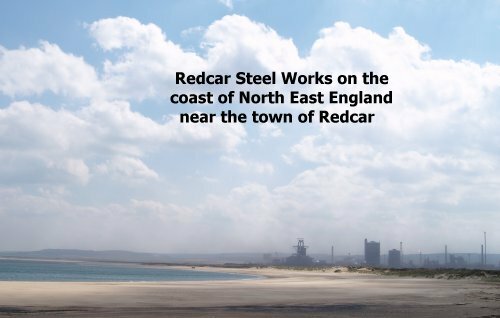 It is an important source of employment and income into towns like Redcar. This steel works closed in 2010 and in an area already hard hit by the decline of traditional heavy industry over the last fourty years but I'm glad to say the steelworks reopened in 2012 providing much needed jobs for the Teesside area BUT has since closed permanently in 2016! A mineral train of limestone or lime filled wagons from Swinden Quarry in the Yorkshire Dales. 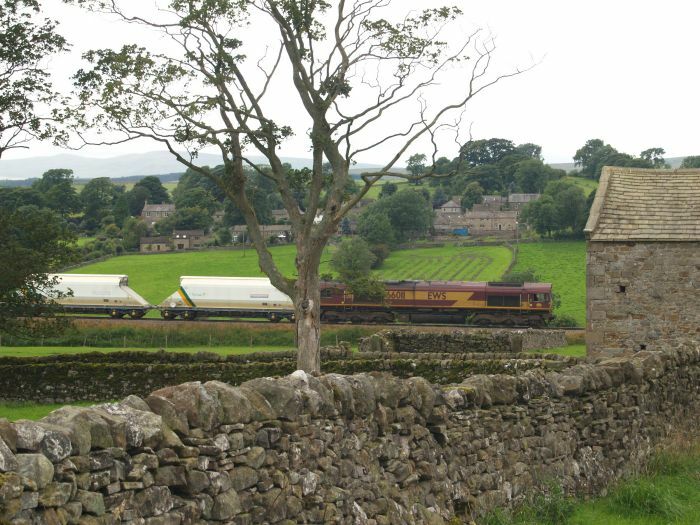 The local stone walls, barns and houses are also made of limestone – a useful naturally occurring resource.